Teacher. Leader. Motivator. BUT KIDS JUST CALL HIM COACH. 1,100+ Alumni in College. 250 Pro Players. 3 Hobey Baker Winners. The Northern Cyclones, proud member of the United States Premier Hockey League (USPHL) announced today that National Collegiate Development Conference (NCDC) captain Jake Sutton has committed to play his collegiate career at SUNY Plattsburgh, an NCAA Division III program out of Plattsburgh, NY. The Wisconsin Dells Ducks, proud members of the United States Premier Hockey League (USPHL), are pleased to announce that defensemen Brayden Cooper has committed to play college hockey at the University of Northern Illinois. Northern Illinois, a member of the American College Hockey Association, will be making their debut at the Division I level in the 2019-20 season, joining the brand-new, seven-team conference, Midwest College Hockey. Brayden Cooper signed with the Ducks in the summer of 2018 following a very strong Wisconsin High school career. The 6’0, 170 Ib. native of Clinton Wisconsin, was a big part of the Ducks D-core, who was able to play in every game this season. “Cooper came to the Ducks with a great attitude, he showed it over the year. He did everything right not only on the ice but off the ice. It was a pleasure to coach him and watch him grow as a hockey player and a man.” The Ducks wish Cooper good luck at the next level. Over the course of the last two weeks, the American Hockey League (AHL) has announced their end-of-year awards and accolades, recognizing the league's best in a variety of categories. Among those recognized is a former goaltender from the USPHL's Premier Division - Shane Starrett. Starrett, who is currently plays for the Bakersfield Condors, AHL-affiliate of the Edmonton Oilers, has been named a Second Team All-Star and All-Rookie. In the description provided by the AHL, Starrett is regarded as one of the top goaltenders the league, playing a pivotal role in Bakersfield punching their ticket to the Calder Cup Playoffs for the first time in franchise history. The Bellingham, Mass., native made 42 appearances during the regular season for the Condors, earning a record of 26-7-5. His 2.31 GAA, four shutouts, and 27 victories rank top-three in the league (among qualified goaltenders). Starrett's .918 save percentage was also tied for the league's fifth-best mark. This is for team use only. Not for individual player use. 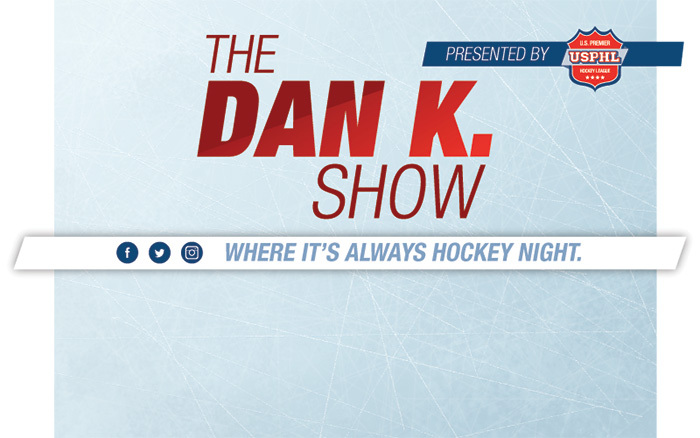 Tweet at the @The_DanKShow using the hashtag #DanKshow. Ask Dan your questions and tell him what you're thinking.